Cancer is often driven by the accumulation of genetic alterations, including single nucleotide variants, small insertions or deletions, gene fusions, copy-number variations, and large chromosomal rearrangements. Studies of genome sequences have revealed that proteincoding genes account for <2% of the human genome. These data not only allow for, but also call for, the development of methods and tools that can efficiently detect cancer-related mutations and genes. 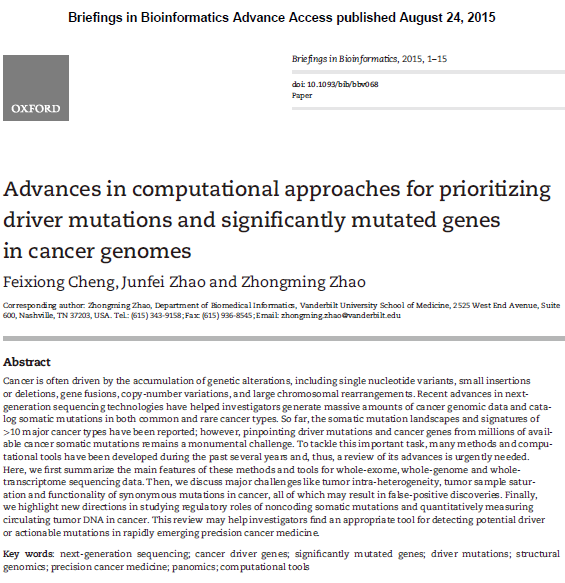 In response to the large volume of mutations being generated from massively parallel sequencing projects, it is urgently needed to find highly efficient ways to prioritize driver mutations that can be further selected for experimental validation and clinical applications. Building a gold-standard positive data set (experimentally validated functional mutations) is always a difficult task for machine learning-based tool development. They found that no algorithm was able to accurately predict SNVs that should be taken forward for further experimental or clinical testing, while combination of different tools could modestly improve accuracy and significantly reduce false-negative predictions. They observed the expected patterns that protein domain mutations (e.g. both known and new cancer hotspot mutations in kinase domains) are recurrently mutated in both oncogenes and tumor suppressor genes. 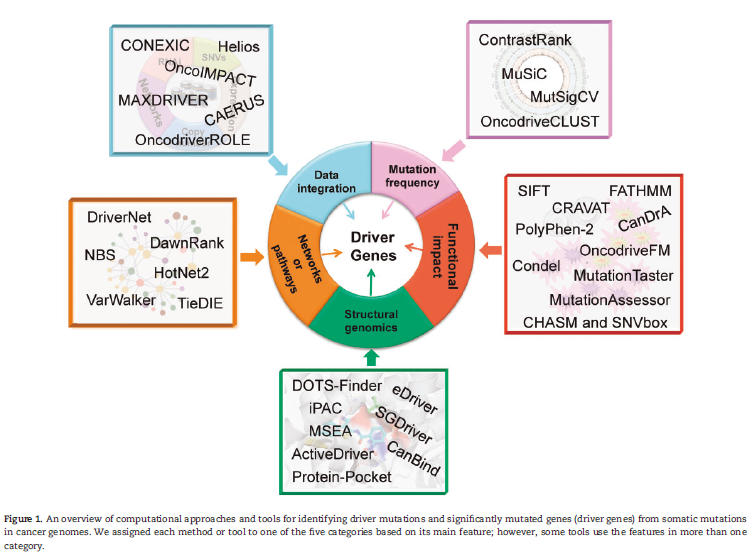 Thus, developing an integrative framework by incorporating somatic mutations, structural variations, gene expression and methylation into the improved knowledge of the human interactome would provide a more comprehensive catalog of significantly mutated networks or pathways in cancer. Combining two or more methods by their complementary biological hypotheses may improve the prediction accuracy of each individual tool. The genomics landscape of individual tumors enables systematic investigation of antitumor immunotherapeutic responses driven by somatic mutations.